Keeping your home clean is no small task. The bathroom, the kitchen, the dusting, sweeping, organizing, decluttering; it can add up to no less than a full time job! Scrubbing spills out of the carpet. Most people when they spill that glass of wine or cranberry juice on their beautiful carpet immediately run for the rag and the club soda and begin scrubbing away. However, this is highly counterproductive. 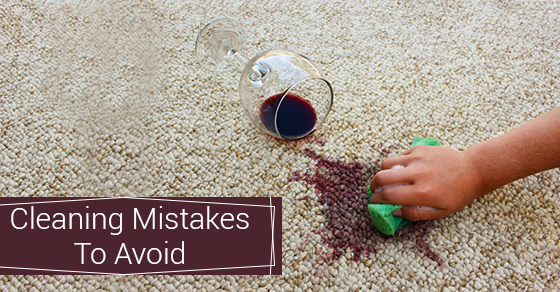 Scrubbing carpets actually begins to unravel the carpet fibres and ingrains the stain in even further, causing permanent damage. Cleaning windows while the sun’s out. Not only are you cooped up inside, but the heat of the sun will cause the cleaning solution to dry rapidly, leaving streaks on the glass. Your best bet is to work on a cloudy day or a day when the temperatures won’t cause liquids to dry up quickly. Deodorizing the garbage disposal with coffee grounds. If you have a garbage disposal, it is necessary to deodorize it as bacteria and food particles that become trapped over time will start to smell bad. While many garbage disposal manufacturers say it’s fine to put coffee grounds into the grinder, not giving the grinding mechanism a thorough rinsing afterwards can lead to the ground actually clogging the machinery which can lead to smelly, non-functioning machinery. The wrong tools for the wrong jobs. Using the wrong tool for the wrong job is usually the biggest problem within the context of kitchen cleaning. For example, the common green-backed cleaning sponge is great for the bottom of heavy-duty pots and pans or the grill, but will wreak havoc on plastic, ceramic and laminate. White-backed sponges, however, are much more gentle. Cleaning, for most people, is not fun to begin with. It can become doubly tedious if you are creating more work for yourself and damaging thing around your house in the process. Keep in mind the above five mistakes to avoid when cleaning and be confident that you are getting the job done right and keeping your house not only clean, but in full working order.